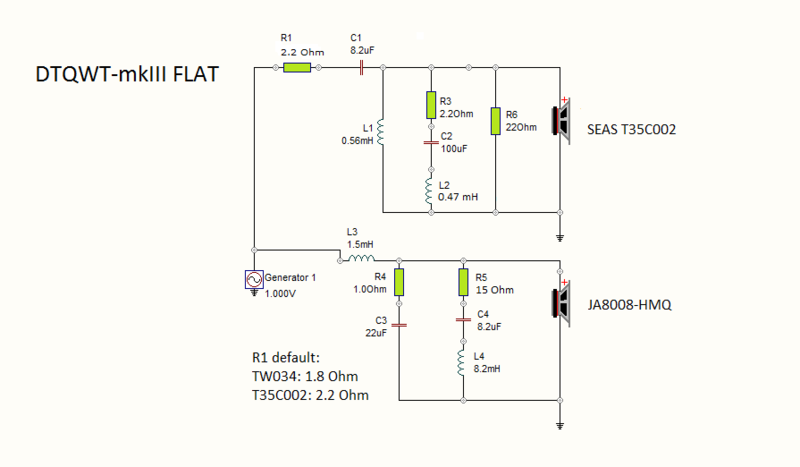 I've named this page TQWT/DTQWT-mkIII-FLAT, but could also call it TQWT/DTQWT-mkII UP-GRADE as it describes the use of the new JA8008-HMQ driver in the cabinet of TQWT/DTQWT-mkII or any previous version. Some people would like to use the new JA8008-HMQ driver in their previous flat front panel cabinet versions without having to change the front panel design. When the new JA8008-HMQ driver was launched I reckoned there would be a limited demand for this, but there have been a few requests, as kids and cats can be rough on the foam surround of the old JA8008 driver, so here it is. 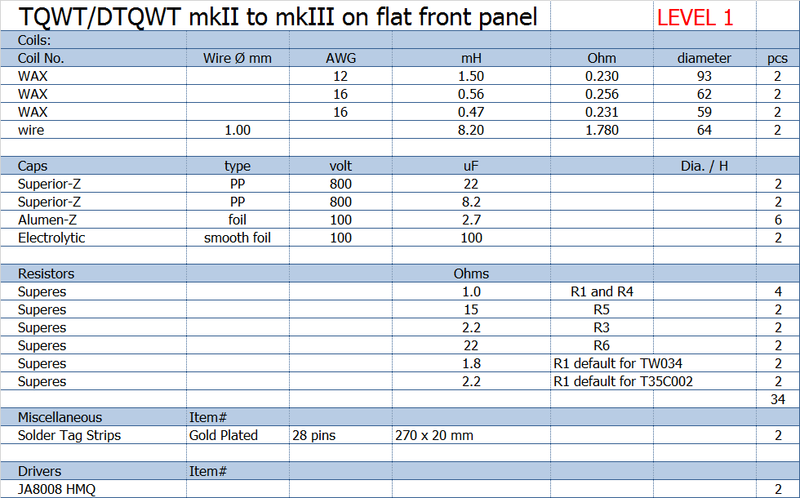 Should you loathe the stepped front panel of TQWT/DTQWT mkIII, this is obviously also a solution for a new construction with a flat front panel. Just add the bass section crossover and you're flying. The stepped front panel was introduced to allow better timing of the drivers and implementation of a true LR2 crossover, something that pays off in terms of sonics. Pulling the waveguided dome some 20-22 mm forward calls for a higher order crossover like used in previous versions. 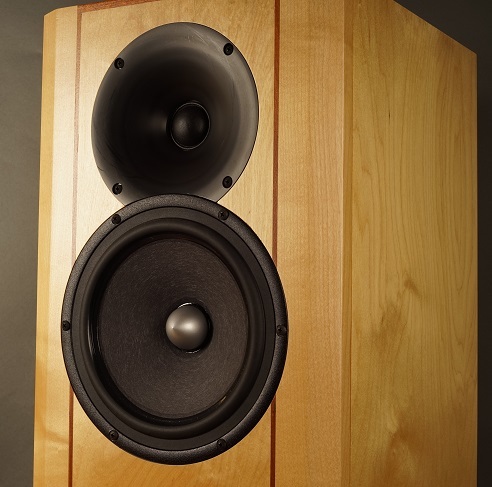 However, the low point of crossover of the mkIII, 2 kHz, is maintained and the added presence of upper-mid/lower-treble of the stepped mkIII is fully intact. The bad news is that you not only need the new JA8008-HMQ drivers, but also a new crossover as it is different from previous versions due to the change of point of crossover and slopes. To provide proper phase integration and flat frequency response the filter above will produce a close to LR4, 4th order, roll-off of both drivers. The Audax TW034 and SEAS T35C002 tweeters use the same crossover, only the SEAS T35 requires R1 = 2R2 for proper balance. 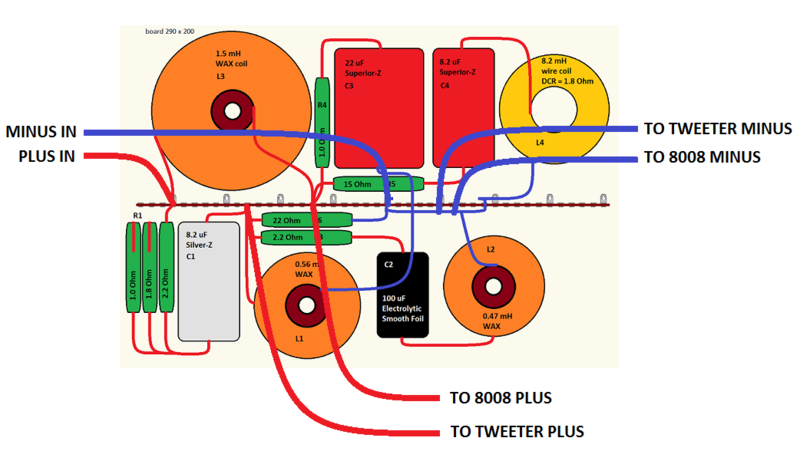 A number of resistors follow the kit to tune tweeter level to your taste, but don't be seduced by high tweeter levels! Causes ear fatigue over time. R1 = 1.0 Ohm is really only for tizzy treble addicts. All for the customer! Above the fine-tuning of JA8008-HMQ driver. Red = response of driver with no crossover. 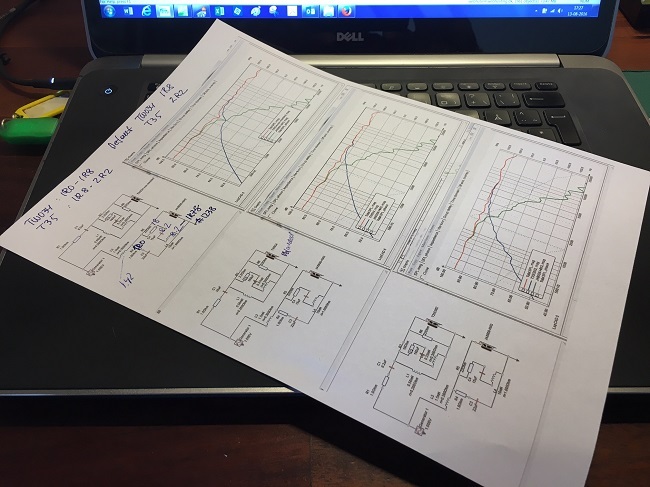 Green is without the LCR circuit. Orange final response from crossover seen above. FLAT midrange! 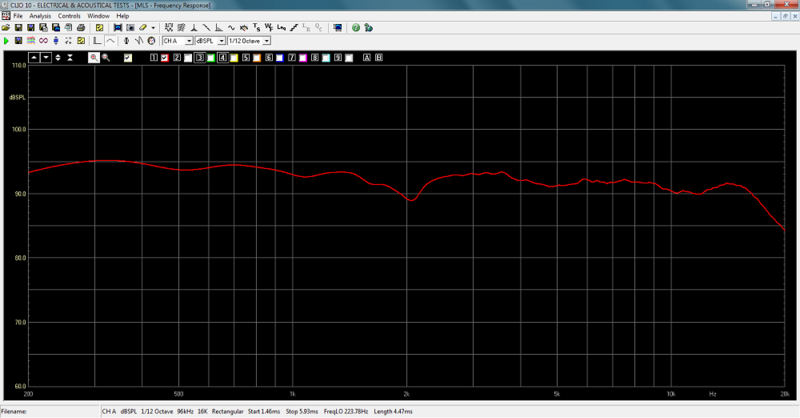 Final response from using Audax TW034 tweeter. The TW034 (un-modified) has a small dip a 2 kHz but compared to the SEAS T35 it's inaudible. Blue = SEAS T35 tweeter response and orange = system response with T35 tweeter compared to TW034 reponse (red). Economy version, yet with Silver-Z for tweeter and STANDARD-Z for parallel caps. If you have the mkII version crossover, you have 2 x 5.6 uF and 2 x 6.8 uF. These can be re-used by adding 2.7uF and 1.5 uF respectively to make 8.3 uF, which is perfectly OK - and you save money. 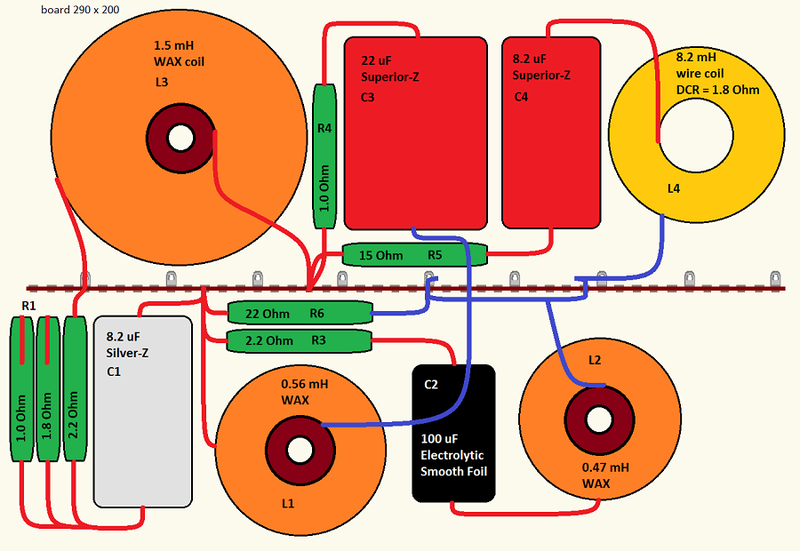 Ask Jantzen if interested to replace all four 8.2 uF caps with 2 x 1.5 uF and 2 x 2.7 uF. These are the only components that can be re-used. 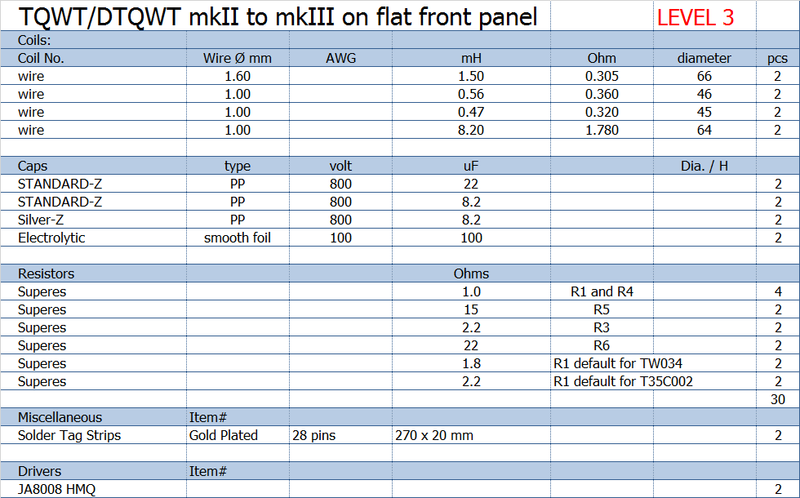 Should you for design reasons prefer a flat front panel, you can buy a complete kit to make the DTQWT-mkIII-FLAT. This kit will include crossover parts for the bass drivers, either for 1 x 12" or 2 x 10-12". The kit for the 2 x 10" and 2 x 12" bass driver versions is the same. Go to Jantzen Audio website here.